The “tsssss” sound of twisting that cap off a soda bottle, the sweet taste and fizzy feeling…it’s an addiction to many. I know quite a few people who are trying to kick the nasty habit of drinking diet soda, I’m hoping some of this information will help! 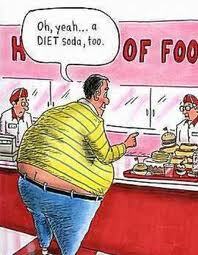 So if you’re trying to lose weight, don’t think you’re being healthy by switching to diet soda! Skip the soda and drink water…seriously, your body needs it! But if you absolutely need something sweet, skip the fructose, sucralose, and aspartame…instead, look for Stevia. Skin — Redness, itching, swelling, blistering, weeping, crusting, rash, eruptions, or hives (itchy bumps or welts). These are the most common allergic symptoms that people have. Stomach — Bloating, gas, pain, nausea, vomiting, diarrhea, or bloody diarrhea. Lungs — Wheezing, tightness, cough, or shortness of breath. Heart — Palpitations or fluttering. Nose — Stuffy nose, runny nose (clear, thin discharge), sneezing. Joints — Joint pains or aches. Eyes — Red (bloodshot), itchy, swollen, or watery. Neurological — Anxiety, dizziness, spaced-out sensation, depression. A woman actually experienced sudden blindness due to aspartame poisoning! While researching for this post, I came across a great blog post regarding diet soda…I highly recommend checking it out!